Let's start off with moisturizers. This is always a good place to start when venturing into a new product line, and is also a great category to try and save some money. Moisturizers are generally for just that - to give skin an added dose of moisture - and sometimes offer additional ingredients to soothe, brighten, or clarify if you choose a more tailored product. I tested out the Nuxe Crème Fraiche de Beauté, a milky softening cream that melts into the skin and gives it a comfortable, (never greasy) fresh feel for the entire day. I love how it can be used on so many different skin types - dry, sensitive, normal - and just creates a very soft, silky complexion. I used this after having a bad reaction to a certain acid toner and was so pleased with how it reduced redness, stopped itching, and helped my skin back to normal. 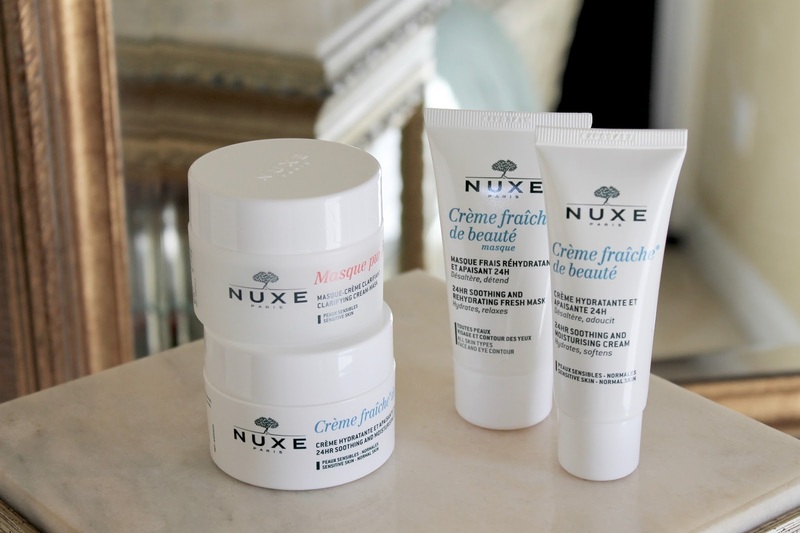 I've also been using the pot version of the Nuxe Crème Fraiche de Beauté, and my skin loves that as well. It is a bit more intensely hydrating than it's liquid counterpart, but it leaves my skin with a soft matte feel even so. I'd recommend these beautiful creams to anyone who loves a moisturizer that sinks in completely with a more satin finish, and also to anyone with mildly sensitive skin. They're so soothing and comfortable, like your favorite white t-shirt. Now, onto masks. You know how much I love to experiment with masks, and after testing the creams, I knew these would agree with me as well. The Nuxe Masque Purifiant Doux (or the Clarifying Cream Mask with Rose Petals) is the perfect detoxifying mask for someone with sensitive skin, that doesn't like the dry and tight feel that so many clay masks can leave. The rose helps to soften and tone the complexion, while coconut oil moisturizer, and kaolin draws out impurities. I love how gentle this mask is, and the poreless skin it leaves me with post-use (and never brings on breakouts like some). I've been using it once or twice weekly and have noticed a much more clear complexion. 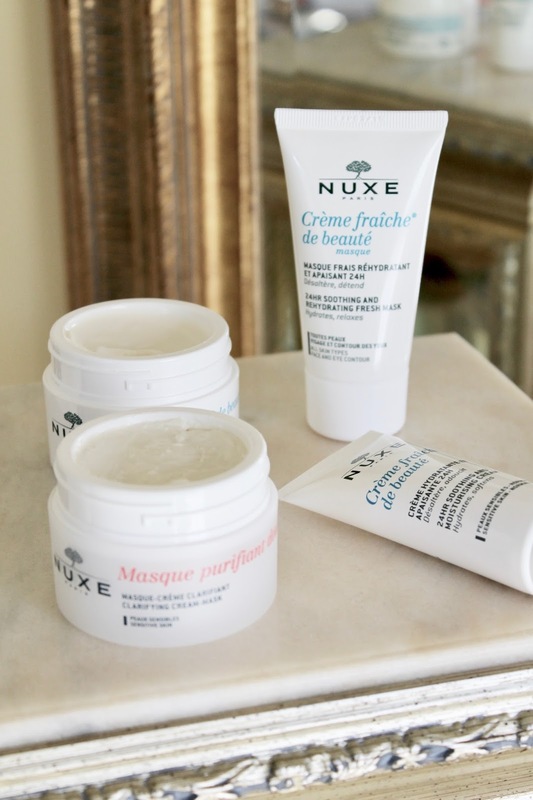 The Nuxe Crème Fraiche de Beauté Masque is another beautiful option for all skin types. This is a more fluid cream mask enriched with plant milks and is meant to de-stress and moisturize the skin, leaving it plumper with a beautiful rosy glow. I love how soft and fresh my skin feels after use; if you're looking sallow or tired this is the perfect antidote.